I have seen a large number of Office 365 related complaints lately. The main one being after an update it causes our accounting program to crash when dragging an e-mail over to attach. The other big one is outlook will randomly decide it is time to auto-update right when someone is trying to send out that important e-mail. Because the business I work for can send out lots of time-sensitive e-mails this can be a real problem. 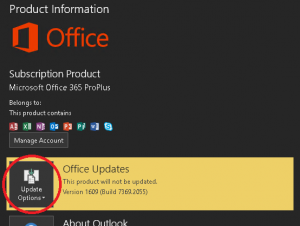 But luckily it is not too hard to disable Office 365 updates. 1. In Outlook, Excel or other office products go to the file menu. 2. Next you want to look for something that says “Account” or “Office Account” on the left hand side. 3. Then on the right hand side of the screen you should see a button called “Update Options”. 4. When you click this button some options should come up and one option is to disable updates. After all this time Microsoft still sends out bad updates that mess things up. But they still insist on trying to force updates on everyone. 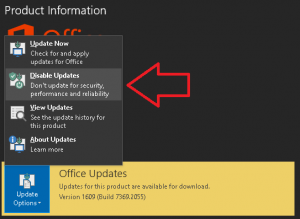 At least this should turn off the Office 365 auto updates and you can always come back here later and update manually when needed. This entry was posted in Tutorials on June 14, 2018 by Zack.